Recovery is vital to the development of our ASICS GTC-ELITE athletes. NormaTec is the leader in rapid recovery— their systems give a competitive edge to the world’s elite athletes, coaches, and trainers. Our goal is to establish recovery as an integral part of every athlete’s training, and we feel NormaTec systems are the best way to accomplish that. The NormaTec PULSE Recovery Systems are dynamic compression devices designed for recovery and rehab. All of our systems use NormaTec's patented PULSE technology to help athletes recover faster between trainings and after performance. Their systems include a control unit and attachments which go on the leg or hips. They use compressed air to massage your limbs, mobilize fluid, and speed recovery with our patented NormaTec Pulse Massage Pattern. 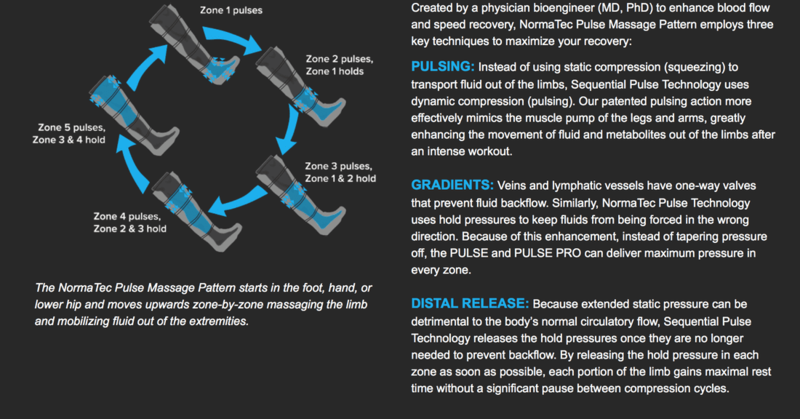 When our athletes first use the systems, they experience a pre-inflate cycle, during which the connected attachments are molded to their exact body shape. The session will then begin by compressing the fee or upper quad (depending on which attachment they are using). Similar to the kneading and stroking done during a massage, each segment of the attachment will first compress in a pulsing manner and then release. This will repeat for each segment of the attachment as the compression pattern works its way up the limb.